Spanish F1 drivers have always been something of a rarity, but Pedro de la Rosa's rise to the top echelon coincided with a new surge of national pride. Suave, polite and dedicated, he had swiftly transplanted himself from his native Barcelona after starting his career in karting and winning the Fiat Uno championship. Britain was the place to be, and there de la Rosa raced hard in Formula Ford. So hard that he won the championship, before graduating to Formula Renault in 1992 where, once again, he was champion. The momentum wound down as he progressed to British F3 in 1993 and 1994, however, sapped by a tough learning year and then a disastrous encounter with a Renault engine that was no match for its Japanese opposition. Like so many unsuccessful drivers before him, de la Rosa sought solace in Japan, racing in F3 there with fabulous success in 1995. His season with the TOM's team yielded eight wins in the nine-race championship, and catapulted him into Japanese F3000, or Formula Nippon, for 1996. By the end of 1997 he had won that championship, too, and began looking to F1. Though he didn't race much in 1998, he was test driver for Jordan, and he used that experience and his bountiful support from Spanish fuel giant Repsol to secure a racing seat with Arrows for 1999. He stayed with the team in 2000 and had a contract for 2001 but at the last minute was dropped by the team and had to settle for the Prost Grand Prix test drive. This lasted only a couple of months before de la Rosa was drafted in to Jaguar to replace Luciano Burti. He stayed at Jaguar Racing in 2001 and 2002 but was then dropped and disappeared from the F1 scene for a while before being taken on as a test driver for McLaren in 2003. He remains in that role and raced in Bahrain in 2005 when Juan Pablo Montoya was out of action, finishing fifth. 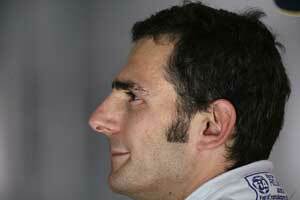 He was called back to the race team in 2006 when Montoya left the team unexpectedly. Pedro did a solid job but was replaced at the ened of the year by Lewis Hamilton, staying on as test driver again in 2007.